Life is Short. Enjoy Yourself. Recently I had cheesecake with a sprinkling of sponge toffee topping, a fun play on the classic dessert Crème Brûlée, and it reminded me of Törökméz. Translated from Hungarian as “Turkish honey”, Törökméz is a spongy, fragile candy that quickly shatters as it hits your teeth, and then melts in your mouth when it lands on your tongue a second later. The super sweet treat is usually homemade and as I ate the cheesecake I suddenly remembered making this Turkish honey as a child; Pauline called it “capalov”. The main ingredients are sugar and honey, and sometimes walnuts too, with a secret ingredient that causes it to bubble it up like a honeycomb. 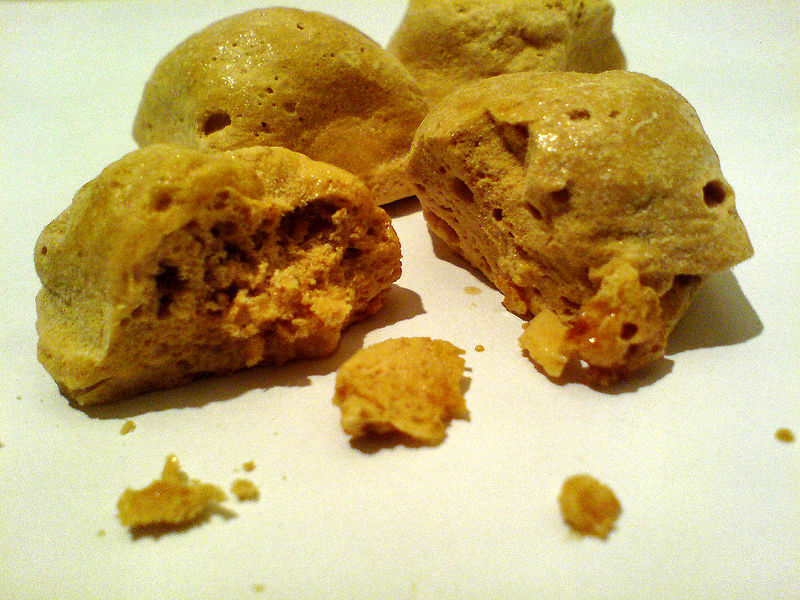 Sponge toffee is similar, made with brown sugar and corn syrup. When you can’t make it yourself, the next best thing is to buy it as a candy bar – the Crunchie bar in Canada and in the UK, or the Violet Crumble in Australia. Capalov was something that was bought at the local village fairs (jarmok) in Slovak towns. Kids would always come home with it. In Australia we call it ‘honeycomb’ and I have made it a number of times. We also have ‘Crunchie’ in Australia and ‘Violet Crumble’, the Crunchie is lighter in texture, more airated and the Violet Crumble is denser and much harder. I would describe the capalov as being something inbetween the Crunchie and the Violet Crumble. It brings back memories when I was in Pivnica in 1977 and visited the ‘jarmok’ that came to Pivnica, I came home home with capalov, hid it, only to find the following day that someone had stollen it and ate it. I was not a happy 8 year old. Thanks for sharing about capalov.